Magpie Quilts: Another Baby Chevron! The beautiful Minky backing flannel was bought last summer while on a road trip with my mom at a little quilt shop in the town of Vegreville. 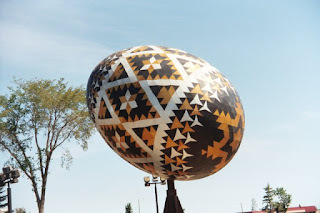 This prairie town is best know as the home of the giant Easter egg. The chevrons are a variety of Kona cottons in coordinating colours - two shades of coral, and two shades of turquoise, a light gray and white. Quilting is in the ditch (along the seam lines) of the chevrons. I've seen some lovely quilting on chevron quilts, but I like to keep it simple when I have Minky on the back to keep the soft drape of the fabric. I still have enough Minky to make another baby quilt and I've got a few ideas to change up the front using the same colours, but with a different pattern. What about you? Do your purchases come with a story? Are your souvenirs related to your hobbies? Canadian Maple Leaf Table Runner Finished!